Thanks very very much for this 2-fer Hanalex - really appreciated! 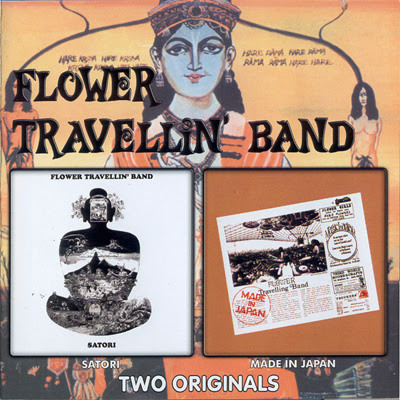 Flower Travellin' Band began in the late '60s as the cover band of Japanese entertainer Yuya Uchida, who took the role of the vocalist together with a female counterpart, Remi Aso. Under the name of Yuya Uchida and the Flowers they recorded an album called Challenge, including new versions of the time's hits, such as Janis Joplin's songs. 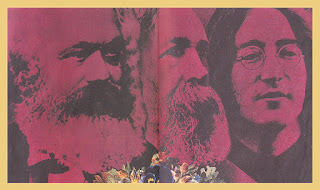 The band received a lot of controversial attention due to their LP cover image, which presented the whole band in nothing but their birthday suits. After the album was released Aso left the group and Uchida stepped down to concentrate on other things. This lead the remaining members continuing by themselves under the name Flower Travellin' Band, still produced by Uchida. Together with new vocalist Akira "Joe" Yamanaka, they released the album Anywhere in 1970, which again featured artistically remade covers, including an early cover of Black Sabbath. The members even decided to give a new try for the naked cover, this time riding motorcycles. Both of the cover albums were very well received with music lovers and critics alike. However the next release, Satori, made the deepest effect, especially into the Western world and is often being said to have been released well ahead of it's time. The heavy metal styled psychedelic rock tracks, originally created by F.T.B., are praised for influencing a variety of bands with their unique sound and generating whole genres of psychedelic progressive rock/heavy metal and it's sub-styles forward. The album was also released in the USA and was a bit more successful in Canada, where the song Satori part 2 even reached the charts. In 2002, the movie director Takashi Miike used the whole Satori album as the soundtrack to Deadly Outlaw: Rekka, where it's played in special chapters throughout the film. Yuya Uchida and Akira "Joe" Yamanaka both appeared in this movie, which told a story about conflicts in the Yakuza. After the success Flower Travellin' Band had, they opened for many top acts and released two more albums: Made In Japan and Make Up. In 1973, they were appointed as the opening act for The Rolling Stones, which was later canceled due to vocalist Mick Jagger's visa problems. Later on the same year, the band disbanded in order for the members to try their chances on solo careers. After the breakup, the side project album Kuni Kawachi and Flower Travellin' Band's Kirikyogen was released. The record had originally been finished in 1970, but due to producer Uchida not being completely satisfied, the release date had been pushed back. Akira "Joe" Yamanaka has had a long and rather successful solo career and he has even played some of Flower Travellin' Band's songs at his concerts. Guitarist Hideki Ishima only released one album, but remained in the music business. He's known for his self designed instrument the sitarla, which is a combination of an electric guitar and a sitar, an Indian string instrument. In January 2008 the world received joyful news that Flower Travellin' Band had reunited, and in their words, "decided to make a fuss once again." The group hired one new member, keyboardist Nobuhiko Shinohara, and will perform at the well-known Fuji Rock Festival in July. They've also have plans to release a new album sometime this year.....Released in September 2008, 'We Are Here' album was recorded in Toronto and presents a new style, in which heavier elements are reduced to a minimum. In some ways a pity, since previous releases the band, where there were a mixture of heavy metal and progressive rock, inspired a lot of bands representing the heavier musical trends. However, this change meant that the music is quieter and more laid back; 'We Are Here' will reveal to us its unique depth, if you just give them the chance and time. Singer Akira 'Joe' Yamanaka died 07th August 2011 on lung cancer. He was 64 years old. It asks for a password. Is there one? Link is dead. Any re-up in mind ? Thanks a lot for your work and dedication. Sorry about that. And thanks again for a great blog.